Falvey Memorial Library :: Feedback Friday: Do graphic novels grab you? Feedback Friday: Do graphic novels grab you? Are they glorified comic books? Or do some deal with weightier issues? 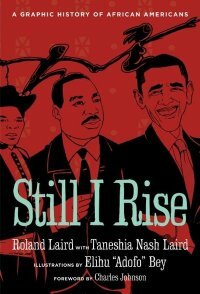 We have a little of both (“Still I Rise” is on order). Have you read any graphic novels lately? Are there certain titles we should have in our collection? Prior to taking Mary Beth Simmons class, Advanced Expository Writing, I would have easily said that graphic novels are glorified comic books. Having a classroom discussion about one definitely changed my perspective though. We read Kate Williamson’s “At a Crossroads: Between a Rock and My Parents Place,” which was a coming of age(ish) story about being at home after college. It was quite good, beautifully illustrated, and addressed some challenging issues of today’s college graduates. I think the issue here is that comic books have a long history of not being taken seriously. Masking even the most serious of these works as “graphic novels” discredits the medium altogether. I think that comic books stand apart from literature, and should be approached differently. Like any other artistic medium, one will come across variations in quality, and execution. It has only been relatively recently that the bright gems in the industry have been sorted from the muck by the general public and media. Still it is highly unfortunate that, even with the recent breakthrough of comic books, the medium is still only perceived as a breeding ground for the next Hollywood blockbuster. Because of this, even comic books with much artistic integrity (Watchmen, From Hell, League of Extraordinary Gentlemen – all “turned into” movies) have a poorer chance of being considered picked up by the serious scholar, or the casual reader. One really doesn’t have to look for an original title to experience some of the ingenuity in comic books. Even amongst the stock titles of the genre, one can find brilliance (see Superman: Red Son). and there are some excellent ones. I for one think that they are a really important “new” form of literature. I nominated Persepolis for One Book Villanova last year but couldn’t get the committee to see it as a viable choice — just a little too far off the conventional map. I actually think that Japanese Manga also often rise to the level of “literature,” certainly at a minimum to the level of excellent genre fiction. Has anyone read Ghost World by Daniel Clowes? We will check the other titles in the library catalog too. We’ve been adding graphic novels over the years and are interested in your choices. Absolutely. My friend introduced me to graphic novels back in high school and I think that the collaboration between author and artist demonstrates a fantastic tradition that brings stories to more people, and brings a vivid message to the table. While some G.N.s may be purely fiction, some offer historical information, such as: Maus(the Holocaust), Rurouni Kenshin(Japan after a revolution) and The League of Extraordinary Gentlemen(a collage of classic story characters). I own a small collection of graphic novels, but would love to see them in more libraries, because they are addictive and buying hundreds of books is never convenient nor wise. I would second the suggestion of Alan Moore’s The League of Extraordinary Gentleman, Volumes I and II. I have not read any graphic novels till date. But I have read comics. Due to their similarity, I can note the appeal that they have on many readers. Graphic novels cater for a clear picture of a story to develop in the reader’s mind so that it is easier to relate to. Thus, the experience of reading that particular book will always be appealing to the reader as it is an interesting experience to visualize scenarios and storylines.